I also know that every Sunday SHOULD include some of the teaching of the Trinity. It is important. It is incredibly rich. It is part of explaining how God is redeeming both His People and all of creation. The problem is that there is just so much good stuff to share with each other in the future! We have to focus our attention occasionally. 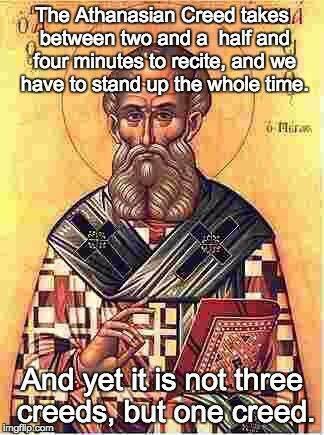 Athanasian Creed according to Scripture <–is probably best for this Sunday. I will admit that it will make many people uncomfortable. It requires “theological thinking.” That discipline takes practice and effort. If you aren’t ready for that, you are missing a treasure.